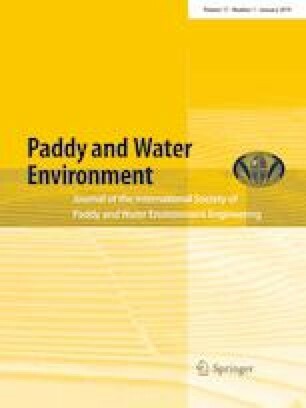 A field experiment was carried out to determine the emissions of nitrous oxide (N2O) and methane (CH4) and yield of rice grains under water management of continuously flooded (CF) and non-continuously flooded (NCF) systems and to find out those were affected by both input of water managements in combination with urea granulated with nitrification inhibitors (neem and dicyandiamide) and zeolite. Urea combined with zeolite and nitrification inhibitors (NIs) reduced the emission of N2O in both plots of CF and NCF compared with urea alone, while the release of CH4 was induced, especially at CF plot. However, no differences existed in the emissions of N2O and CH4 between the types of urea granulated with zeolite and NIs and urea treatments in both water input managements. A paired comparison between CF and NCF plots revealed fewer emissions of N2O and CH4 in NCF plot with urea granulated with zeolite and neem treatments. Urea with zeolite and NIs did not have any effect on improving rice grain yield different from the effect of urea alone. The nitrogen use efficiency employed in this study had little effect on delayed oxidation of NH4+ in the soil of both plots of rice field. The study showed that the water management or practice of irrigation promises to reduce the emissions of N2O and CH4 compared to nitrogen use efficiency application. These works were supported by Institutional Collaborative Agriculture Research (Hibah KKP3N) of Ministry of Agriculture and Ministry of Research, Technology and Higher Education of the Republic of Indonesia (Hibah Penelitian Kompetensi). We are very thankful to Adriani, Nurul Fajratullah, and Juniarti of Department Biology, Universitas Negeri Makassar, and Junja Baba of Soil Science Laboratory, Chiba University, for all valuable works during the experiments.